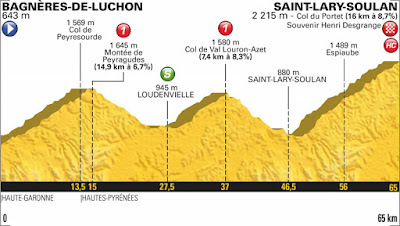 I expect that this will be an absolutely brutal stage, with potentially big changes in the general classification. 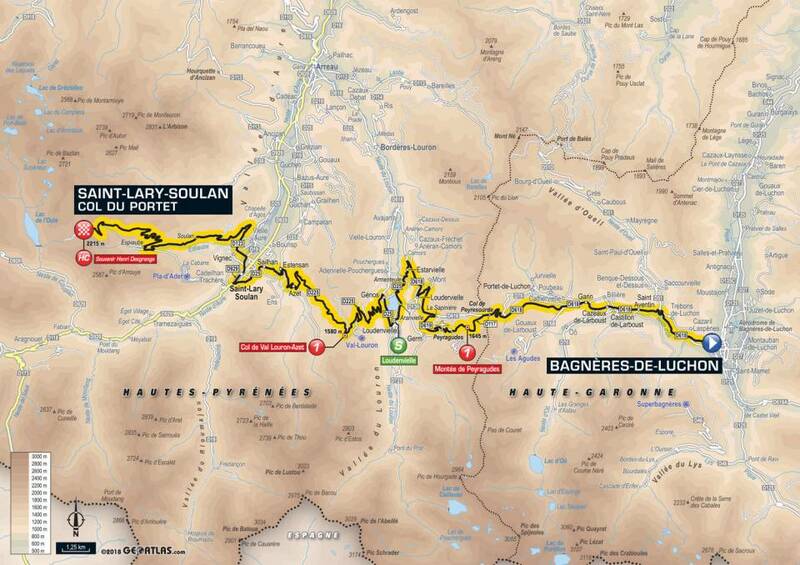 But, of all the mountainous stages in this year's tour, I had this one pegged as the easiest. 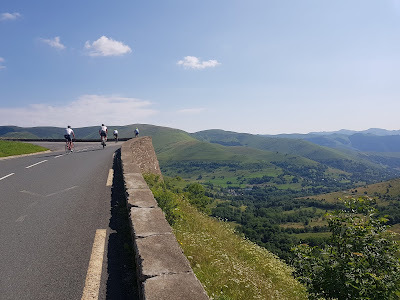 For me, duration is as much a killer as elevation gain (sometimes more so), and so I was looking forward to getting straight into it, and not having to grind myself down in the valleys. 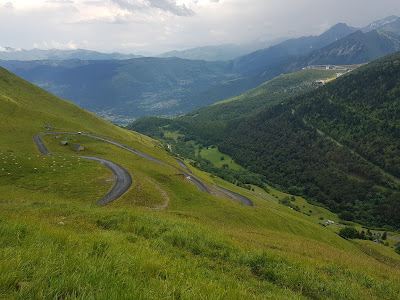 It was also a nice opportunity to revisit the Peyresourde, which I rode in 2013. The day started in Spain, and no-one seemed too perturbed about our previous evening's descent being the wrong side of the Col du Portillon, which was good. Breakfast was decidedly un-French, but wholesome enough. Despite pointing the camera at us regularly over the last few weeks, Matt seemed surprisingly short on words! We assumed the short route over the Portillon was indeed closed, and instead took a longer route through the valleys, and we made an unusually late start, just after 9:30am. 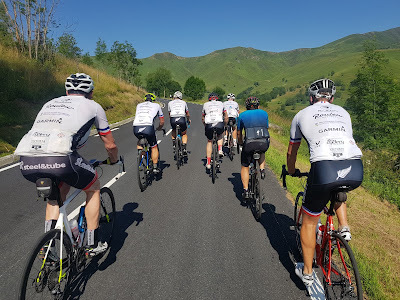 There were quite a few other cyclists on the road, and I settled into a bunch with Aaron, Mike, Paul and Stu, as well as Matty and Jonathan. Aaron's been doing bloody well, given his relative lack of cycling experience, and size. 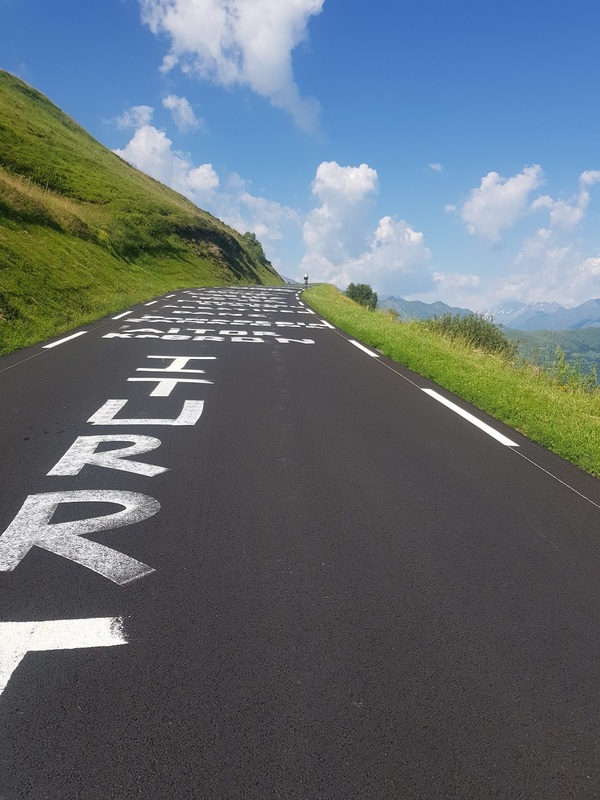 But, I knew he was a bit worried about the climbing today, so gave him a bit of a hand every now and then on the way up to the Col de Peyresourde. I was keen to work hard, after our huge dinner last night (we were served four big trays of paella, and after eating my fill, was just committing to not ordering any dessert, when a quarter chicken, some mushrooms and frites were put down in front of me...! ), and helping Aaron out seemed like a good use of my strength. Last time I'd been up here, the weather was in the process of crapping out, so it was lovely to see it with the sun shining. After about 15 seconds of descending, we swung left off the main route onto the climb up to the ski resort of Peyragudes. Matty was going great guns, and even had time to knock out a facebook update on this stretch. On the climb up to the village, we could see the next road on the opposite side of the valley - a fairly intimidating sight, even when you couldn't see down to the valley floor! 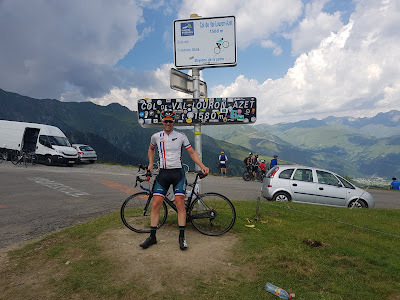 The descent was a rip-snorter, and at the bottom, I met up with Matty, who was over the moon (that is his usual state, I suppose, but he'd enjoyed very much his first alpine descent. 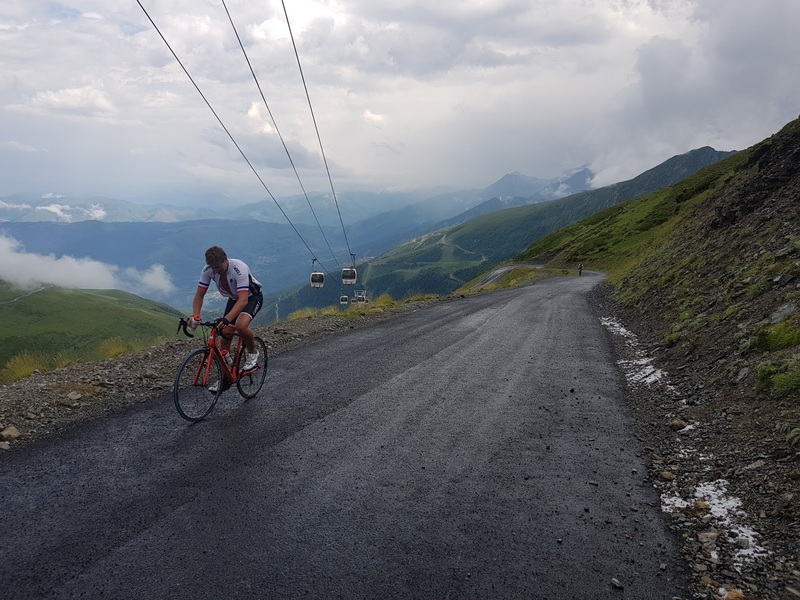 At the bottom of the next climb, which was only a kilometre or two across the valley floor, I reconnected with Aaron, and made sure he got to the Col in as good a shape as possible. 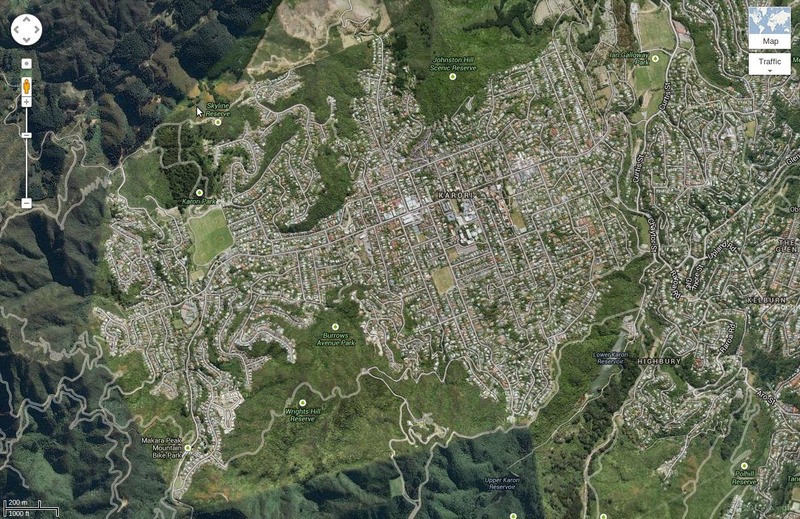 We weren't the only ones making good use of the elevation! ... but it was foreshortened by large raindrops beginning to fall. I grabbed my gore jacket, and set off, and by the bottom had caught up with Stu, Bruce and Mike. I felt a bit bad that I hadn't let Aaron know I'd be heading up alone - I'm struggling enough to keep on top of the 36-32 on the steeper climbs, and the Col du Portet averaged almost 9% for 1400 vertical metres. The Col du Portet is making its debut in the tour, but all the initial signage was for the Pla d'Adet. 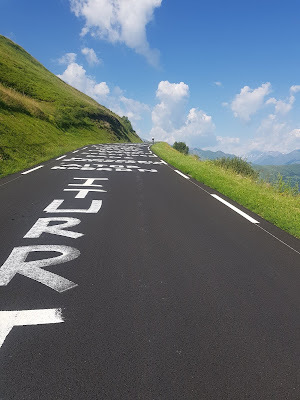 The turnoff for the Col du Portet was well signposted, but not well marked, and in the confusion I was joined by Stu, and we rode much of the 8km remaining together. 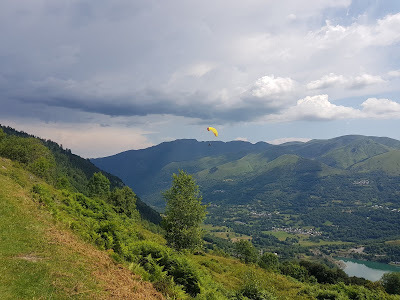 About 2km out, it started hailing - there'd been a bit of thunder around the place, but the rain on the Val Louron-Adet had come to nothing. For a while, it was pretty light, but then the heavens really opened, and the hail started to hurt. Luckily, Bill had pulled up with one van, and while Stu continued, I cowered under the rear door for close to five minutes, until the hail had stopped. Jonathan and Julie were on their way down, and I swapped out my now-sodden lycra jersey for a dry Gabba, and put on a winter hat, and then knocked off the last couple of k's. 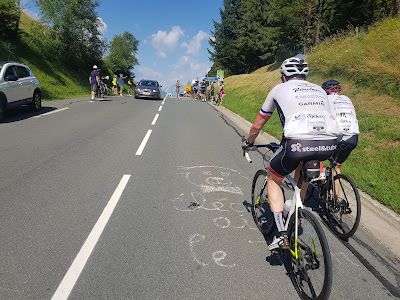 By the time I'd got ready to roll down, I'd seen Steven, Stu, Mike, Bruce and Aaron at the summit, and 30 seconds down the road, saw Matty and Paul on their way up. The descent was reminiscent of New Zealand roads in its design, and was nowhere near as fun as the earlier two descents had been. 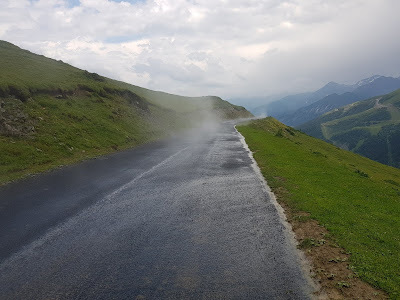 The hail had not only melted, but the water was now being evaporated off the warm road surface, throwing up impressive clouds of steam in places. 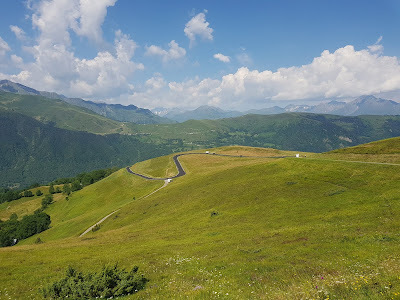 I hadn't seen Jason, and that remained a mystery until just before the intersection with the Pla d'Adet road - he'd missed the turn, and had continued on to find Roger in the village, and had started to pack up! But, he was on his way to the top, and with the bit between his teeth, by the looks of his face! We had a bit of a wait at the intersection for Jason to complete the climb, but it was a nice opportunity to eat and warm up after a relatively chilly descent. The French women passed while we were there, and we were able to give their somewhat depleted bunch a good cheer. We're overnight in Tarbes, with a flattish stage to knock off tomorrow. Today's ride was arduous, but in my opinion, one of the easier stages we've done. The surroundings were beautiful, but primarily, the ride duration was relatively short. 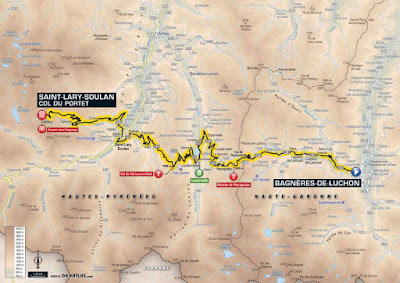 Our next mountain stage, in a couple of days, will surely be beautiful, but will likely be on par with the Madeleine / Croix de Fer / Alpe d'Huez epic, in terms of length. Strava: 74km ridden in 5h15 elapsed, with an average moving speed of a mere 15.4km/h!!! 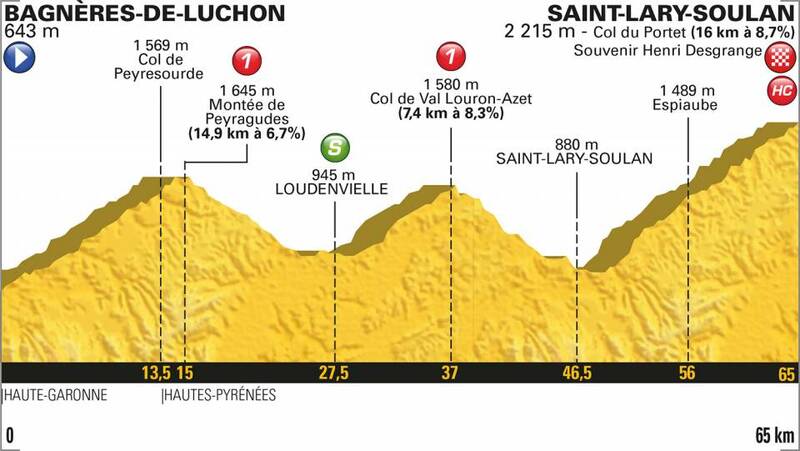 That, due to the two Cat.1, and our 7th HC climb of this tour.